us some popular blogs about Capoeira. I hope you will find these blogs interesting and add them to your bookmarks. Sabrina’s life is driven by Capoeira, even if she can’t practice anymore. Her blog is a goldmine for those eager to find out more about Capoeira culture. Gringa Mansa dedicates her time to introduce famous mestres, history, books, movies, exhibitions, songs and so on. She even gave us a short interview. I started training in Los Angeles in 1984 or so, with a Brazilian teacher (not a mestre) named Paris. In early 1987 I joined GCAP in Bahia, Brazil, training with mestres Moraes, Cobrinha and João Grande. What about the Gringa Mansa blog? I started the blog as a sort of autobiography, including the diary I wrote when I first arrived in Brazil, and it has become a way of keeping people informed about what is going on in the Capoeira world these days, particularly in Bahia. I’ve had visitors from all over the world – including China, it seems! What would you like to say to the Capoeira Mandinga Shanghai group? Make sure that Capoeira is more than just a physical activity. 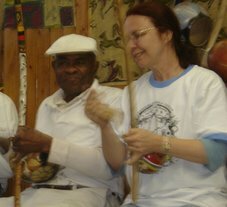 It has to include the mind and soul, and involve music, song, African-Brazilian culture and the spirit of resistance. Thank you, Requebra and Gringa Mansa for little interview! Requebra, who is number one capo-blogger?